The silence of the studio. Images courtesy of Jacob’s Pillow. Technical/ Lighting Director, James Angot; Sound Engineer, Jerome Malapert; Administrators, Caroline Southon, Sophie Demont. Dancers: Francois Alu, Alexandre Carniato, Takeru Coste, Laura Hecquet (Soloist), Josua Hoffalt (First Soloist), Allister Madin (Soloist), Samuel Murez, Ludmila Pagliero (First Soloist), Maxime Thomas, Simone Valastro (Soloist), Lydie Vareilhes, Pauline Verdusen. There were eight U.S. premieres out of ten works performed at Jacob’s Pillow last night by 3e Étage: Soloists and Dancers of the Paris Opera Ballet. Of these two were new from 2011 while three dated to 2006. The fact that so much of The Disorders Program was new to American audiences is a reflection mostly on how rarely 3e Étage under its artistic director, Samuel Murez, gets to travel. The company is an offshoot, an aspect, or attic if your want to be literal, of the oldest classical ballet company in the Western World. Now in its 350th year the Paris Opera Ballet was founded during the Ancien Regime of Louis XIV. The original intention was to provide entertainment for the aristocracy confined to Versailles under the watchful eye of The Sun King. This was the origin of what evolved as ballet and why all of its movements and terminologies are French. It was of course usurped by the Russian court and, as a cultural paradigm, survived even the Bolshevik revolution. Although War and Peace was one of the first great works to be written in modern Russian the novel by Count Leo Tolstoy is written about aristocrats who spoke French. Today the ballet seems more Russian than French. You know, Tchaikovsky, Stravinsky, Diaghilev and all that. So it was fascinating to see an aspect of the great and venerable French company, the heart and soul of ballet, and not yet another classical Russian interpretation. In every respect, mes amis, this was an evening that was truly, tres, tres français. In introducing the company 3e Étage, Ella Baff, the artistic director of Jacob’s Pillow, between the lines, implied some coercion to pry the dancers loose from Paris and travel to the bucolic Berkshires. There are two primary issues. First, the dancers are primarily obligated to the schedule of the Paris Opera Ballet and only tour off season. When, one might imagine, dancers would prefer some vacation time. Secondly, the company is less an independent artistic entity and more about perfecting skills in a most demanding art form. So while the rehearsal process and challenging exercises are at the core of what we experienced it is also the task of the director, Samuel Murez, to make the studio work challenging, interesting and fun. The process is more internal to the development and artistic excellence of the dancers and less about engaging and entertaining an audience. Although we were the flabbergasted recipients of a performance that definitely had its voyeuristic aspects. This was particularly evident in Processes of Intimacy featuring the sublime duet of Ludmila Pagliero and Takeru Coste. One sensed the intensity and isolation of the studio. There was no musical accompaniment but rather as sound design by Jerome Malapert and Samuel Murez in the form of softly uttered cues ending with a count down “cinq, quatre, trois, deux, un.” At the end of which the dancers quickly embraced as the audience burst into applause. The evening started on the purest and most elegant classical statement. La Valse Infernale choreographed by Raul Zeummes, to piano music by Franz Liszt, after Giacomo Meyerbeer, is fast paced and technically challenging. The technically precise and demanding exercise was performed with stunning execution by Francois Alu, Ludmilla Pagliero, Allister Madin, Laura Hecquet, Simone Valastro. While the men performed a series of pirouettes we were introduced to the astonishing athleticism of Alu, the designated leaper. He put the extra twist before landing that had the audience burst with applause. Which, with consummate showmanship, and just a dash of arrogance, he acknowledged with a nod to the audience. It is the flash of hubris that one expects from the greatest stars. After all these years it is what I recall about seeing Nureyev in Boston performing Don Quixote. It wasn’t much of a ballet other than those epic leaps by the great Russian dancer. When he went up, up, up while you held your breath and wondered when he would come down. Alu gave us flashes of that during the evening on several occasions including the hilarious spoof Trois with Allister Madin and Simone Valastro. Set to Brahms after Paganini it riffed on three male dancers competing and upstaging each other. They hammed it up wonderfully including Madin leaving the stage to hang out with the audience. While Valastro goofed and camped in parody of classical dance. The crowd, as they say, went wild. As the program progressed it morphed from the sublime to the ridiculous and back again. In addition to classical ballet there was a large portion of mime and dance. Think of Marcel Marceau in white face en pointe. Or something like that. The program kept us guessing as well, we have never really seen anything quite like this. There was a constant sense of variation and invention. You gave up trying to understand or follow what you were seeing and just let it happen. 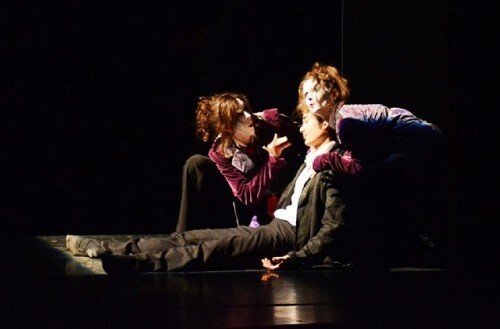 After some solo skits, so to speak, the mime aspect came to fruition in Épiphénomènes. This was a fully developed narrative created and starring Murez as the character The Trickster. He magically manipulated Jill (Ludmila Pagliero) and Jack (Takeru Coste). Using a cane as a wand he was able to stop, start and seemingly rewind the couple. The Trickster is an outside agitator of their relationship which ranged from conflict, anger, slapping and fighting to romance and tenderness. All at the whim and for the amusement of the Prankster. Until he looses interest and they seemingly die. Enter the macabre and cackling grave diggers Ivan (Laura Hecquet) and Igor (Pauline Verdusen). They make a big deal of dragging the corpses off stage with many amusing variations. We come to realize that there are two currents at play: The serious, classical ballet, and on the other hand prankish mime. They are constantly intersecting and disrupting each other. The mimes also have an unique vocabulary of movements mostly entailing slouching and boneless flailing on hands with comic flourish. The corpses in various incidents keep flopping to the stage to be carted off. At times to appear and disappear. It is a kind of running gag. As is the use of clever lighting. In the tradition of the great clown Emmett Kelly the following spot becomes a character. It keeps eluding a mime who runs off stage returning with a revolver to shoot it. The threat seems to calm down the naughty spotlight. The gun is stuck in a pants pocket. Until another mime pulls it out and it has turned into a banana. There was a lot of stuff about bananas until the audience was a bit bananas. Oh yes, there was a lovely solo Les Bourgeois set to Jacques Brel and danced by Alu. And something deconstructed, how French, with text in English and French, ME2, with music of The Misters and text by Raymond Federman. Like most post structuralism I haven’t a clue what it was about. But I suppose I could fake it if I had to. It just kindah seemed interesting. Oh well. That led, I suppose, to ME9 when the entire company returned in white face for a truly rambunctious finale. The audience burst into a standing O and the choreographed bows went on, and on, and on. Wow. What an awesome experience. Hey mes amis, as we say en Anglais, y’all come back yah heah. Hopefully, that’s not lost in translation.